This ballet flat has a patented lining that feels like a silky sock encasing your foot. The footpad has extra padding so you feels as if you are walking on a cloud. The rubber sole is flexible allowing for the wearer to wear in any environment. The pair comes with a matching tote bag so that the flats can travel anywhere and everywhere. They are pure luxury to wear after hours in heels and are stylish enough for most every occasion. I needed new flats and wanted something with support that did not look boring. These flats are sassy and extremely comfortable and they fit true to size. Love the material, it's very well made and the padding inside is soooo comfortable. They are soft with good quality leather that makes them easy to walk around in all day. I have this in Brooke Natural Multi Silk Snake Lac Style. I no longer run to throw on sneakers with everything. I toss on these and can go all day without being uncomfortable and I get lots of compliments. I have a trip coming up soon and these will be going with me. They are very sophisticated. They look great with jeans, dress pants, & skirts. I usually cannot wear shoes without socks but these are made so well that I can do that. They also feel more like a sock than a shoe. I wear them pretty much every day. The materials are so cushy which is great because it doesn't aggravate my bunion on my right foot. This fun design will be a nice change from black. I want to buy them in every color! I was able to wear it from the first day without having to break it in. Even better, I can wear it at work for hours. These beautiful shoes also come with a cute and very well made bag so you can take your shoes everywhere with you. Let me know what you think and what color you choose if you win http://shop.ballasox.com/products/brooke Thank you so much for reading. I received one or more of the products mentioned above for free using: https://www.tomoson.com Regardless, I only recommend products or services I use personally and believe will be good for my readers. Those shoes are super cute! I love flats. They're so comfy, and they always look great. Those are so great. I work on my feet all day, so it's nice to wear a pair of flats that also look great. Thanks! Those shoes are so cute. I love wearing flats when my feet hurt, but I need a nice looking shoe. That looks very comfortable on your feet! I love the print and design as well! I love flats! My wife wears a pair somewhat like that.. she says they are the most comfortable shoes to wear. These shoes look so stylish and comfortable. I would like any color, but prefer the colors from the Brooke Collections, any! Lovely shoes. I absolutely LOVE the ones pictured! I've neverhad a pair like these before! This mommy would be extremely excited and Thankful! I would love to win because I don't get to buy myself much and these, I am absolutely IN LOVE with!!! They look so stylish and comfortable! These shoes are so cute. Love the print because its noticeable but not too out there for all ages and gives options for different types of outfits. And if you say they are comfortable even better!!! I forgot to say the color I love... I love the same color shown in the picture. The Brooke Natural Multi Silk Snake Lac Style. These look like super cute shoes! I love ballet flats in the springtime and these would look great with my clothes! Love it! I like the Flower Silk Summer shoe. So pretty! It was hard to pick a favorite but if I had to choose just one pair it would be the Brooke Vibora Linen. I'd love to have all the patterns to wear because they are so comfortable. Shoes are like diamonds, a girl can never have to many lol. I would love the flower silk summer color ! it is gorgeous ! I have never heard of Ballasox before! I will have to look into them because I love wearing ballet flat shoes! So stylish! It looks so comfy, I’m envious! I haven’t seen Ballasox here, so I hope I can order online! I totally would love a pair of these! Great giveaway! These are adorable!! I am always looking for a cute, comfy pair of flats and these just might fit the bill!! Thanks for the review!! i have so been wanting a pair of these!!! i would love the platinum ones!!! thank you so much for the giveaway!!! These are so cute and love many of the patterns! Such a great giveaway! I absolutely love ballet flats. They're so comfortable but I usually find them lacking in arch support (which I desperately need) but these look like they're an exception. I love these flats! They would be great for work and for going out too! They are super cute and look comfortable! I would love the Black/White Houndstooth!! 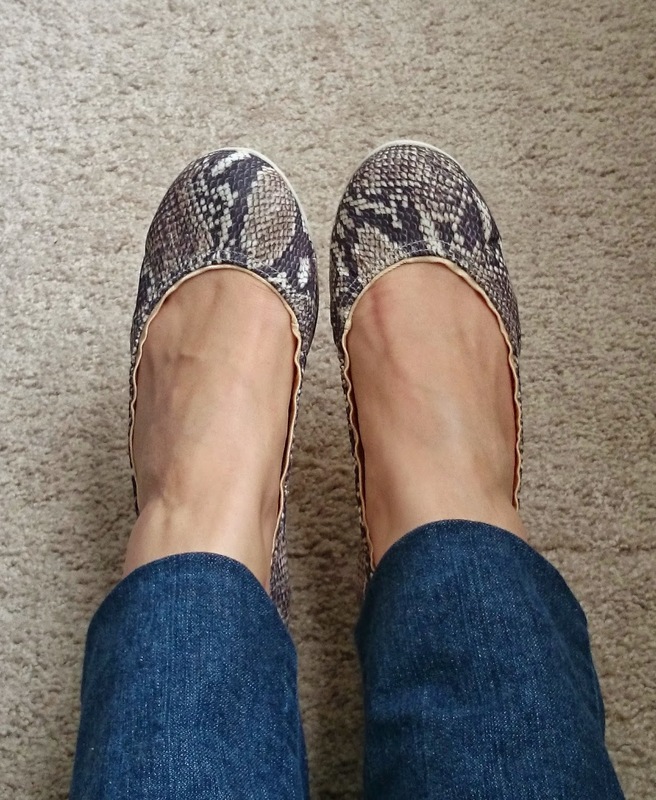 I am loving these flats, they are super cute and look very comfortable! Those look so comfy! I practically live in flats. I love the design of it, looks like good quality. These look so cute. I love wearing flats and these are totally my style for work. I couldn't stop thinking about these shoes for the last couple of days, so I ended up picking up a similar pair to them. I cannot wait to get them now because they look so cute and comfortable. Thanks so much for being my new show enabler haha. These look super comfy. I love the pattern too! I don't usually wear flats because I don't like the way they look on my. I do like wearing flat sandals. Those are so pretty and look comfortable.I love the Rosebush Linen! Great flats! Thanks for the giveaway! Wow, I really love flat shoes, I've never try this ballet flat shoes, I love to have this. I did forget to mention which ones I would love....I would love the Black/White Houndstooth!! Thanks again! My favorite is Flower Silk Summer- Brooke style. I'd like these for relaxing. I think they'd be great to take along on vacation too. These looks really comfy! They kind of remind me of my Tieks, have you tried those? These are really cute flats indeed. I would love to get a pair of these because they are not boring and they look super comfy. Thanks for sharing. These shoes look really cute. I would love them in Floral Paris Faux Leather. Very pretty and they look real comfy. I dream of comfy slip ons. I'm going to need to add these to my wish list asap! I love the look of these flats and the fact that they have additional insole support makes them awesome. I plan to take a look as they would be prefect for traveling. These actually look so beautiful, what a nice and comfortable looking pair of shoes; would be nice around the house! I love the Flower silk summer. They look so comfy and your recommendation is glowing! My favorite is the Ballasox Brooke flat in the Rosebush Linen design. They look like they would be so comfortable. I would so choose the Leopard Silk Summer!! These are amazing. They look so comfy! I can't wear heels so these would be a perfect alternative! !